Graham Taylor will be remembered by many for his unfulfilling spell in charge of England - but by plenty more as an outstanding club manager at Watford and Aston Villa and one of the nicest, most genuine men in the game. The reaction to Taylor's death on Thursday at the age of 72, and the affection expressed for him, was the true measure of his standing inside and outside football. Born in Worksop in Nottinghamshire, Taylor was the son of a journalist and rose to prominence in the game as a manager after retiring as a player with Lincoln City in 1972. He became manager and coach at the club, winning the Fourth Division title with them before moving to Watford in 1977. It was here, in tandem with his chairman Sir Elton John, that he produced arguably his finest work, taking the club from the Fourth Division to the top flight in the space of five exhilarating years. Taylor nurtured Watford legends such as Luther Blissett and John Barnes, remarkably finishing second behind Liverpool in their first season at that elite level and reaching the FA Cup final in 1984, where they lost 2-0 to Everton. Not so long ago he joked with me, with his usual broad smile: "You know I have never watched any of that game from that day to this - but I don't need to see it again to know that second goal from Andy Gray was a bloody foul on our goalkeeper Steve Sherwood." Taylor's unlikely partnership with the flamboyant rock star worked against the odds, the manager's down-to-earth approach dovetailing with his chairman's lavish lifestyle. They remained friends for life, as demonstrated by Sir Elton's heartfelt tribute. On trips abroad when he worked as a BBC Sport pundit, Taylor would gladly tell stories of that partnership, always with a laugh and underlining the genuine affection they shared. Sir Elton John posted an Instagram message to pay tribute to his "brother"
Taylor's brilliance inevitably attracted attention from elsewhere and, perhaps feeling he had achieved all he could at Vicarage Road, he left for Aston Villa in May 1987. Villa were in reduced circumstances having been relegated to the second flight. Taylor soon put that right by winning promotion in his first season - and, not content with that, rebuilt the club with such success and shrewd management that he took them to second place behind Liverpool in 1990. Taylor's methods were tried and trusted and yet he often received criticism for what his detractors perceived as "long ball" football. He, with much justification, pointed out his willingness to use wingers and flair players such as Barnes and the young Mo Johnston, whom he brought to England from Partick Thistle. England inevitably looked in Taylor's direction after Sir Bobby Robson left following the 1990 World Cup in Italy, where his side lost to West Germany on penalties in the semi-final. This was, without doubt, the darkest and most frustrating period of Taylor's career and is one of the reasons his other work has been so criminally underrated over the years. Taylor took over at a tough time after the loss of England mainstays such as goalkeeper Peter Shilton and past captains such as Terry Butcher and Bryan Robson. He gave players like Alan Shearer and Martin Keown their first England caps - but he drew criticism for selecting players many simply felt were not international class, such as Carlton Palmer. England reached Euro 92 in Sweden under Taylor but produced a series of disappointing performances, going out at the group stage after losing 2-1 to Sweden in Stockholm. Taylor courted controversy and criticism in that decisive game by substituting England captain and main marksman Gary Lineker for Arsenal striker Alan Smith with a goal still needed - it never arrived and Lineker never played for England again. The manager was vilified and lampooned as a "turnip" in the Sun newspaper. The campaign to qualify for the World Cup in the United States in 1994 also ended in failure, and was brutally chronicled in the fly-on-the-wall documentary 'The Impossible Job', which gave an intimate insight into the pressures Taylor was under. Those struggles were illustrated starkly in the game that effectively sealed his fate, the 2-0 loss to the Netherlands in Rotterdam. The tortured Taylor is seen on the sidelines pleading with officials after Ronald Koeman somehow escaped a red card for a foul on England's David Platt, only to be reprieved and score the brilliant free-kick that sent the Dutch on the way to victory. He resigned the following month and stayed out of the game until returning at Wolves in March 1994. During his spell in charge he took them into the second-tier play-offs in 1994-95, where they lost to Bolton Wanderers. Taylor left in November 1995 before returning to revisit old glories. Sir Elton John was back at the helm at Watford so it was no surprise when he turned to Taylor to come back to Vicarage Road as general manager in February 1996. 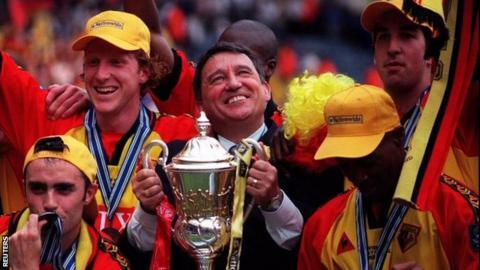 It was once more the perfect fit and he was back as manager a year later, winning the third-tier title in 1998 before putting Watford in the Premier League at the end of the following season after a play-off final victory over Bolton. Watford, despite an early win at Liverpool, were relegated and the following season Taylor decided to retire - only to change his mind and make a comeback at Villa in February 2002. He retired for a second and final time after they struggled the following season. It was the end of one chapter and the start of another as Taylor became a respected pundit on BBC Radio 5 live, a role he performed with total assurance and perception. Taylor was part of the radio team that covered England. It was a sign of the esteem in which he was held by fans as well as players that whenever he encountered supporters abroad, he was treated with complete respect. There was barely a reference from England followers to any of his struggles in charge of the national team. To them, Taylor was a true gentleman, to be given his due not just for his work but for his warm personality and willingness to discuss football matters with anyone he met. He may have operated at the highest level but he never talked down to supporters and was always interested in how they viewed the game. As a BBC Sport colleague, Taylor was unfailingly co-operative and the consummate professional, willing to take a call at any time, even when he was meant to be spending time with his beloved wife Rita. And as well as a fount of knowledge and a man with strong opinions, Taylor was also an endless source of entertainment and stories, just as happy to poke fun at himself as everyone else. Graham Taylor was a top-class manager at club level and a true gentleman inside and outside of football. He will be greatly missed and perhaps now his work in management, viewed through the prism of this sad news, will finally get the credit it fully deserves.